Spring has (finally!) sprung, so this weekend I will be celebrating with an outdoor barbecue. These recipes are all easy and kid-friendly—even the sangria! Spring has (finally!) sprung, so this weekend I will be celebrating with an outdoor barbecue. If the temperatures drop at sundown, I will feed my guests inside, but nothing welcomes the warm weather better than the smell of charcoal. These recipes are all easy and kid-friendly—even the sangria! You might want to add a big bowl of sliced fruit to the spread (I like to use apples, pears, melon, and grapes, but often I pick whatever is on sale). This is a great way to serve a healthy dessert with minimal effort. I also tend to stock up on ground turkey meat when it's on sale, for occasions like this when I'm serving a crowd. This sangria was served at a baby shower I attended and was the hit of the party—even among the guests who weren't expecting! I actually think I prefer this over regular sangria because you get all the taste but none of the headache! 1. Mix everything together and enjoy! If you prefer regular hamburgers to turkey burgers, you can easily substitute lean ground beef for the turkey, although I'm partial to the latter—with a slice of cheddar cheese, of course! The burgers also freeze well, so you might want to double the recipe and freeze ungrilled patties in individual freezer-safe plastic bags for next time. An assortment of fixings: ketchup, mustard, cheese slices, pickles, sliced tomato, avocado, etc. 1. Preheat the grill. Combine the ground turkey, egg, bell pepper, Old Bay seasoning, salt, pepper, and cayenne in a large bowl and mix (I use my hands for this!) well to combine. Form 4 same-size patties and grill for about 6 minutes per side or until cooked through. 2. Meanwhile, cook the waffle fries in the oven according to package instructions and heat up the buns. You can easily heat up the buns on the grill by just wrapping them in tin foil and placing them near the burgers while they cook. 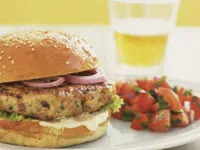 Top each burger with cheese and desired condiments and serve with fries. 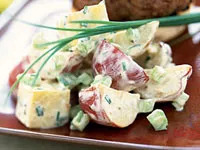 This is the classic potato salad my mom made when I was growing up. It's always been one of my favorites and is great to feed a crowd! 1. Wash the potatoes and boil in water until tender, about 30 minutes. Drain and set potatoes in the fridge to cool. When cool, mash and chop potatoes and season with salt and pepper. 2. Peel and chop the eggs and combine them with the potatoes, diced onions, and chopped celery in a big bowl. Add the mayonnaise and paprika and toss everything well. Refrigerate for at least 2 hours before serving—the longer you let this rest in the fridge, the better it is!